Understanding a bit about the different Washington Lottery games can help you choose which game to play. Some of the lottery games have massive jackpots, but also odds that are millions to one—making your actual chances of winning those massive jackpots very small. Other games offer smaller jackpots with much better odds, meaning you stand a much more realistic chance at winning. For all games except Scratch, you can fill out a play slip—those white sheets of paper with red numbers and text on them. You can pick your numbers or choose Quick Pick, which lets the computer choose random numbers for you. You will then give this slip to the cashier at the lottery counter, or you can use the yellow lottery machines located at many stores. If you use a lottery machine, you can skip the play slip and choose quick pick right on the touch screen. Yellow lottery machines require that you put your money in first and will not give you change. Whatever you put in, you must use to buy a ticket. You can then choose a Scratch ticket, or use the touch screen to select Quick Pick on any of the lottery games, or insert your play slip if you prefer to select your own numbers. Powerball is a multi-state lottery game with huge jackpots. In fact, 42 states, D.C., and the U.S. Virgin Islands all participate in Powerball—the only states that don’t play are Mississippi, Alabama, Wyoming, Utah, Nevada, California, Alaska, and Hawaii. How to Play: To play Powerball, you will pick five numbers between 1 and 59, and one Powerball number between 1 and 35. 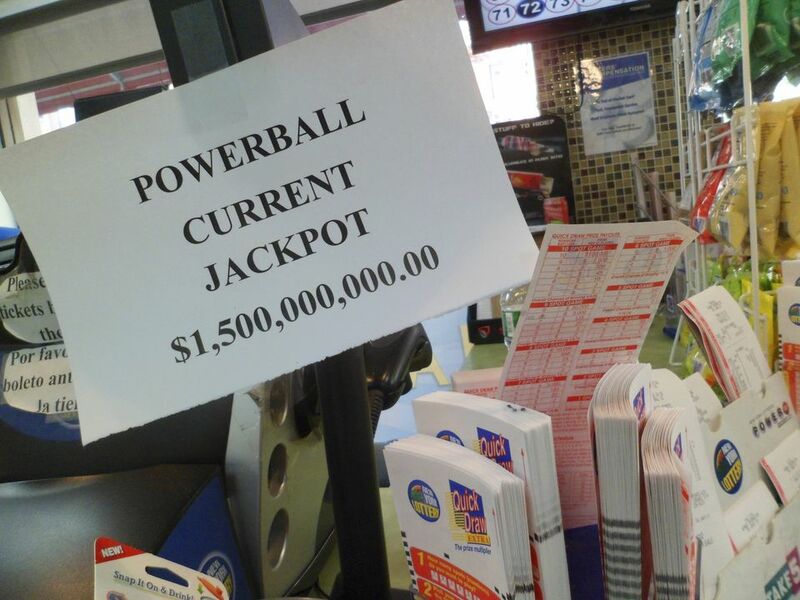 To win the jackpot, you will need to match all five numbers and the Powerball. There are nine ways to win a prize in Powerball, including the huge jackpot. Other prizes are won by getting other combinations of the winning numbers—four of the winning numbers and the Powerball; four of the winning numbers, three of the winning numbers and the Power ball, three of the winning numbers, etc. Numbers drawn: Wednesdays and Saturdays at 7:59 p.m. PST. How big are the prizes? Non-jackpot prizes range between $4 and $1,000,000. What are my odds? Overall odds that you will get any of the prizes are 1 in 31.85, but odds that you’ll win the jackpot are about 1 in about 175,000,000. Mega Millions is another multi-state lottery, also with huge jackpots. Mega Millions is available in all states except for Mississippi, Alabama, Wyoming, Utah, Nevada, Florida, Alaska, and Hawaii. How to Play: Mega Millions is similar to Powerball in that you play by picking 5 numbers between 1 and 56, and 1 number between 1 and 46 for the Megaplier. To win the jackpot, you will need to match all 5 numbers and the Megaplier. Just like Powerball, you can also win smaller prizes for getting anything from the Megaplier only up to four numbers and the Megaplier. Numbers drawn: Tuesdays and Fridays at 8 p.m. PST. How big are the prizes? $2 to $250,000, and the jackpot. What are my odds? Overall odds that you will get any of the prizes are 1 in 40. Odds that you will win the jackpot are 1 in about 175,000,000. Lotto is what many think of when they hear the term “lottery.” The jackpots are high, but not nearly as massive as the jackpots of Powerball and Mega Millions. Additionally, Lotto is only played in Washington State, which makes your odds just that much better. How to Play: You get to play two sets of numbers on a Lotto ticket for the cost of one game. You will pick 6 numbers between 1 and 49. Numbers drawn: Mondays, Wednesdays and Saturdays at 8 p.m. PST. How big are the prizes? If you get three numbers right, you win $3. If you get four numbers, you win $30. If you get five numbers, you win $1000. If you get all six numbers, you win the jackpot. Jackpots start at $1 million and go up each draw until someone wins. What are my odds? Overall odds of winning any prize are 1 in 27. Odds that you will win the jackpot are about 1 in 7 million. Hit 5 is similar to Lotto, but with better odds and smaller jackpots. The jackpots are a great size to, say, buy a home or seriously upgrade your life or even plan for retirement. How to Play: To play Hit 5, you will pick 5 numbers between 1 and 39. You get one set of numbers per play slip. How big are the prizes? If you get two numbers, you win $1. If you get three numbers, you win $10. If you get four numbers, you win $10. Get all five numbers, you get the jackpot! Jackpots start at $100,000 and go up until someone wins. What are my odds? Overall odds of winning any prize are 1 in 8.77. The odds of winning the jackpot are 1 in 576,000. Match 4 is your game if you want to a chance to win $10,000 each and every day. Pick 4 numbers and hope for the best! How to Play: Much like Lotto and Hit 5, you get one play per play slip. You pick 4 numbers between 1 and 24 to play. Numbers drawn: Every day at 8 p.m. PST. How big are the prizes? Match two numbers, win $2. Match three numbers, win $20. Match all four numbers, win $10,000. What are my odds? Overall odds are 1 in 8.70. Odds of winning $10,000 are 1 in about 10,000. The Daily Game won’t make you rich, but this is the perfect game if you’re looking for a little extra fun money. Plus, this is the only lottery game where you can choose in advance which prize you want to go after. How to Play: The Daily Game revolves around picking three numbers between 0 and 9. From there, players can win in nine different ways, but you have to pick which type of the nine ways beforehand. The highest prize ($500) will be if you match the three numbers you pick in the same order you picked the (a straight). Other options include matching the numbers in any order (a box), matching just the first two numbers, or matching the last two numbers. Ticket cost: Depending on the type of bet you do, tickets range between 50 cents and $3. How big are the prizes? $40, $50, $80, $160, $290, or $500, depending on the type of bet made. What are my odds? Odds vary based on game. Daily Keno has even more variations than The Daily Game. Keno is a game where many numbers are chosen from a field of numbers—in this case, 20 numbers are drawn from a field of 80. Depending on how much you wager, how many numbers/“spots” you choose, and how many of your numbers are drawn, prizes can vary wildly. .
How big are the prizes? Prizes vary on how you bet and how many of your numbers are chosen. Prizes range between $2 and $500,000. What are my odds? The best odds you’ll get are on the games with fewer “spots.” The 4-Spot Game has the best overall odds at 1 in 3.68, whereas matching all 10 spots on the 10-Spot Game has odds of 1 in 8.91 million. Scratch is a category more than a game. These are the tickets you’ll see prominently displayed in the yellow boxes, or on rolls under a glass counter at convenience stores. Many Scratch tickets come and go—tickets are printed in a finite number and when the series of tickets is sold out, that’s it. Others are popular series that are reprinted when they run out—there will almost always be a bingo game and a crossword game, for instance. Scratch ticket games offer several price points and will say on the ticket what the largest prize is—but be aware, if all the jackpots for a game have been won, the tickets continue to be sold until they sell out. You might not always have a chance to win the jackpot. If that concerns you, you can check in advance which jackpots remain before you buy. How to Play: Scratch games all have individual rules that will be explained on each ticket. What’s in common across all is that you will scratch off the play area to reveal numbers or symbols. Usually a win is determined by numbers or symbols matching, but not always. If you don’t want to play the game on a ticket, you can also scratch off the barcode and scan the ticket with the scanner on a yellow box or at a lottery counter, or ask the cashier to scan it for you, and find out immediately if you won. Ticket cost: $1, $2, $3, $5, $10, $20—the higher priced the ticket, the larger the highest jackpot. Numbers drawn: Numbers are not drawn for Scratch games. How big are the prizes? Prizes range from winning back the value of your ticket to winning smaller prizes to winning a jackpot, all of which are in proportion to the ticket price. For example, $1 tickets often have a top prize of $1000, $2 usually top out at $20,000, on up to $1,000,000 on $20 tickets. What are my odds? Odds vary on all Scratch tickets, but overall odds tend to hover around 1 in 3.5 to 1 in 4.